I have to apologize guys. 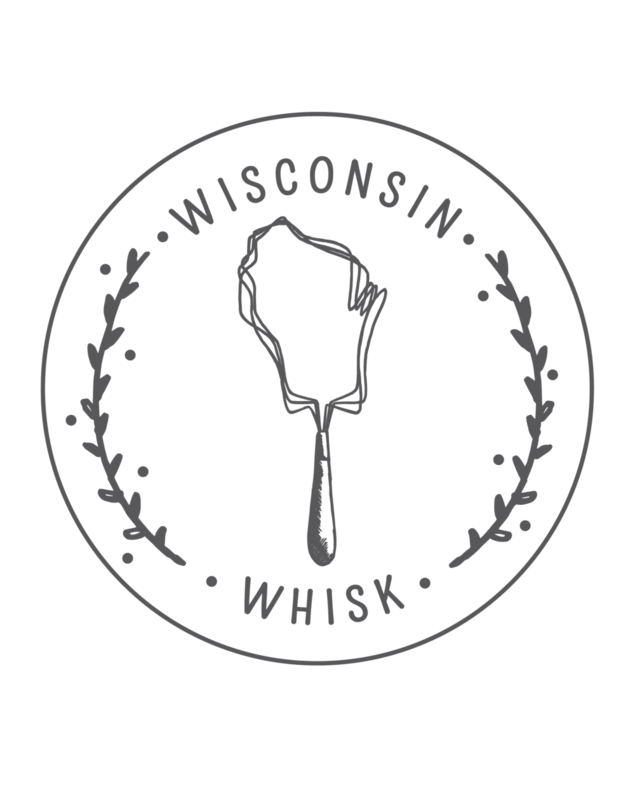 After going through the recipes posted on Wisconsin from Scratch since its inception in early July, I realized we have yet to post anything resembling a breakfast or brunch recipe. Considering that this is the most important meal of the day (not to mention my favorite), this is pretty much unacceptable. So never fear, all you brunch lovers. You have not been forgotten. This week, I have something to make your morning marvelous. I used to not be a big fan of french toast. Really? What was my deal? Clearly, I was not making it right. Not enough eggy batter, spices, or delicious toppings. Well, this french toast remedies all of these earlier problems. And it’s pretty great. As it turns out, the trick to making particularly good french toast is to slice your bread nice and thick. And be sure to give it a nice long soak in the egg batter. And finally, don’t skimp on the butter when you cook these. It’s the only way to get a nice crispy crust, and still keep the inside slightly gooey. 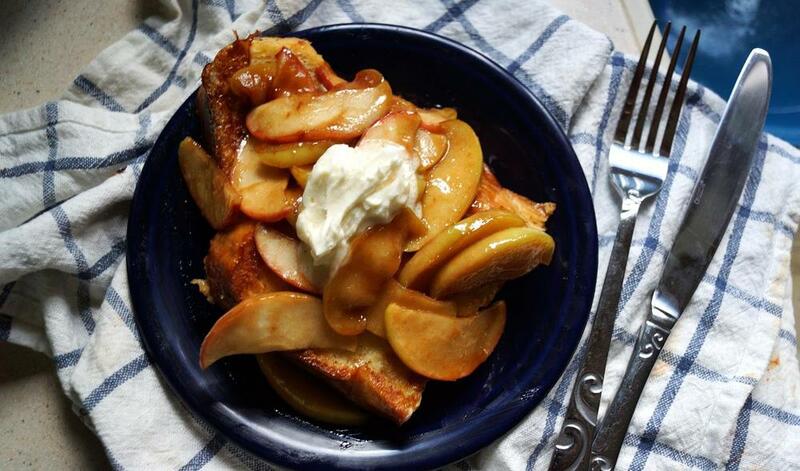 And what with it being National Honey Month and all, a sweet, sticky honey and apple topping is just the thing to elevate this french toast to the next level. Of course, if you’re not ready yet to embrace fall (and aren’t apples the epitome of fall? ), this would also be pretty excellent with peaches instead, you just won’t need to cook them as long. Before I leave you to get your brunch on, let me point out that cooking with honey in general is really pretty fantastic. And in honor of that whole National Honey Month thing I mentioned before, our good friends at Golden Hills Honey are posting more delicious honey recipes throughout the month here. Enjoy! 1. Combine eggs, milk, ¼ tsp cinnamon, vanilla, and salt in a bowl and whisk thoroughly to combine. 2. Pour the egg mixture into a baking dish or pie pan and place bread slices in a single layer in the egg mixture. Let bread soak in egg mixture 5 -6 minutes, flipping bread slices once halfway through. 3. Heat a skillet over medium heat and 1 Tbsp butter and 2 Tbsp honey. 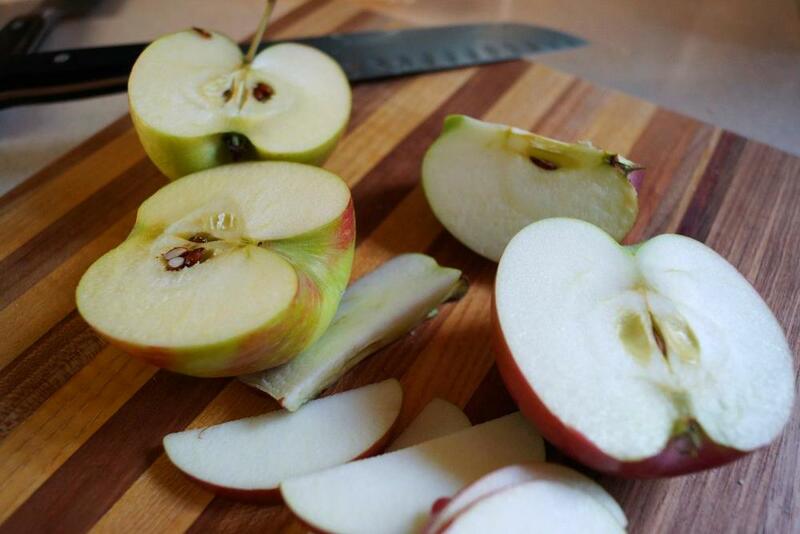 Cook until butter is melted and combined with honey, then add the apples, ½ tsp cinnamon, ginger, and lemon juice. 4. Cook apples for 10-12 minutes, stirring occasionally, until they are soft and fragrant. 5. 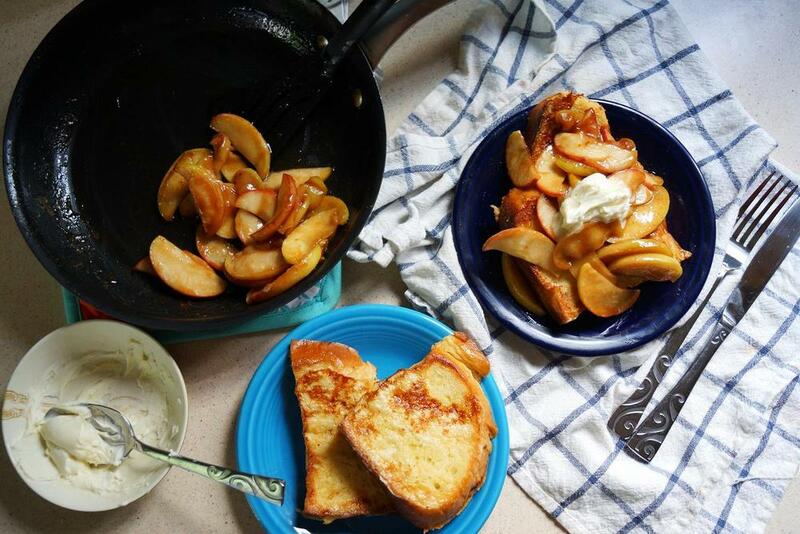 While the apples are cooking, melt 1 Tbsp butter on a griddle pan over medium high heat. Once melted, put the soaked bread slices on the griddle, and cook for 3-4 minutes, or until bread is golden brown. Flip the slices and cook an additional 2-3 minutes until the other side is golden brown. Remove from heat and keep warm while you finish the apples. 6. 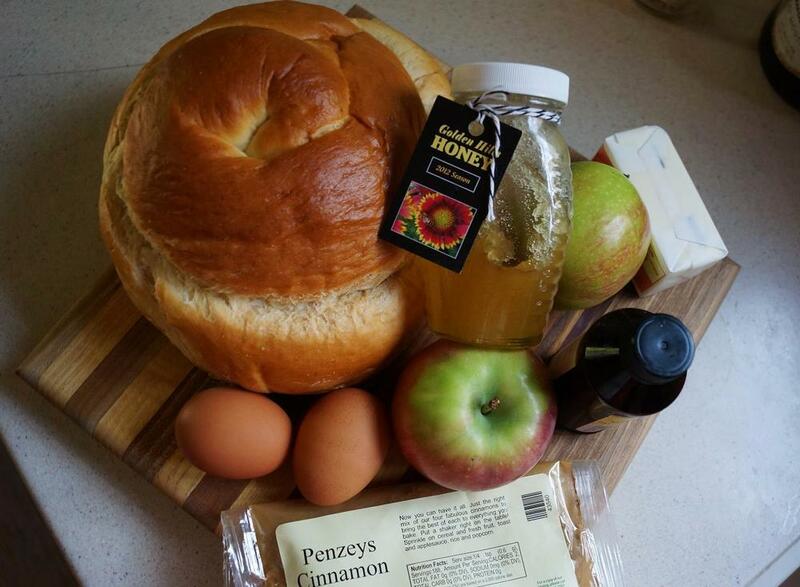 When the apples are done cooking, reduce heat to medium low and add the remaining 1 Tbsp butter and 1 Tbsp honey. 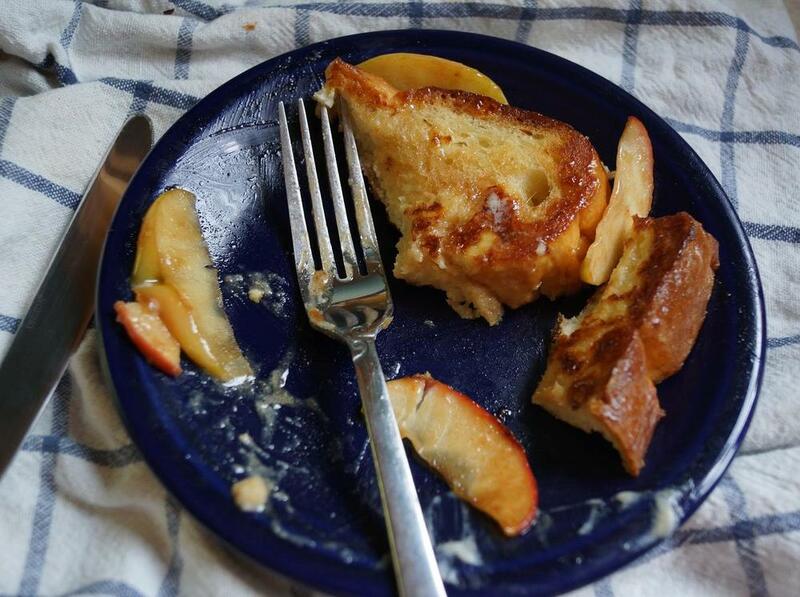 Once melted and mixed in, pour an equal amount of the apple mixture over each of the french toast slices. 7. Mix the mascarpone and 1 tsp honey together. Top each french toast with a dollop of the mascarpone honey mixture. Serve immediately.